Tom, say it ain&apos;t so! Tom, I know we haven’t always seen eye-to-eye but you were my first friend on MySpace, and so, in my book, that made us BFF. Clearly this is aimed at MySpace! 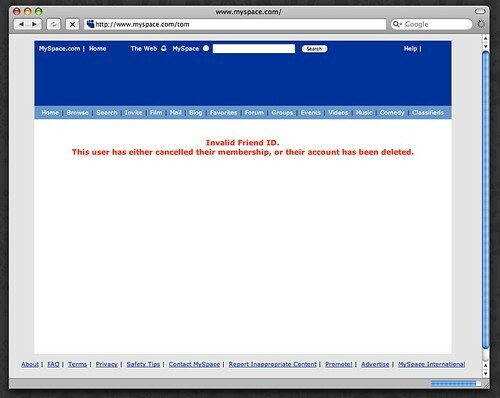 So Tom… when I went to your MySpace page to see what you had to say about it… you’d been deleted! If this act is about “deleting online predators” well, I can only hope that this was a mistake, but… I’m afriad that, Tom, there’s simply no way we can be BFF if you’ve been deleted. Refusing your temptation to even view that site. Nice try, though! HA! So you think this means that Valleywag was right about Tom? Unfortunately HR 5319 goes after things much broader than MySpace. It can easily be interpreted to be any social networking site or on-line community. Even CNN, NY Times, or any other site that captures an identity info for access is in the bulls-eye. This is a horrible pieces of rubbish that has the capability of impacting all of us working on or around or even using social sites. @vanderwal — I actually had a much more serious, angry and wider-scoped post that I was going to write citing the issues you mentioned but decided to poke a little fun instead. This really is a ginormous issue for the community, which, it seems, could be banned entirely from public bastions of education if it goes through. I think it is time to organize some kind of resistance given that the lawmakers seem to know jack about what the web means… or maybe they do, which is why they’re so feverishly trying to shut it down. It happens to be a little *too* Amerikan for their tastes.